Honeymoon Trivia: The word "honeymoon" dates back to the 5th century, when many cultures celebrated events or based their calendar on the cycles of the moon. So, 1,600 years ago, every day during the first moon or month of their marriage, the couple celebrated the event by drinking mead (an alcoholic drink made from honey and reputed to also be an aphrodisiac). During this time they often did not work (which has translated to taking time off and going away). The bride's family usually provided the month's supply of mead, which later became a dowry, and today has led to the tradition of the bride's parents often paying for the wedding! Your honeymoon is a very personal event and you want to make sure you have the perfect honeymoon destination. ​Whether you are looking for a beach holiday, a mountain holiday, an island holiday, a snow holiday or action packed holiday, you need to do lots of research to make sure it is right for YOU. The perfect honeymoon destination will depend on the time of year you are getting married, so please take this into consideration. For example, Santorini in the Greek Islands is a beautiful place to be in summer but a very cold windy place in winter. Many of the tourist shops are closed and the island is almost in hibernation. Summer months are exquisite! This could be your perfect honeymoon destination if it is the right time of the year. If you are looking to do something different - try a heli-wedding on the top of the Mount Remarkables on the South Island, New Zealand - for some, the South Island of New Zealand will be their perfect honeymoon destination. The most romantic places to watch the sunset. A beach holiday or an island holiday are two of the most popular honeymoon destinations with many newlyweds. Featuring pristine beaches, crystal clear water, romantic secluded settings and luxurious over water bungalows, this honeymoon destination is perfect for couples who love snorkelling and diving or just want to relax in the privacy of their own island paradise. This is a unique experience and the top of many honeymooners' lists, however it is at the upper end of the honeymoon budget. The Whitsundays offer many islands that will spoil you for choice - this is a fabulous option for your honeymoon. There is an abundance of activity including helicopter rides and cruises to the Great Barrier Reef cruises and other islands. Each island has a huge selection of activities at your disposal. ​Some islands focus more on couples and some more for families, so we suggest you do lots of research into which island suits you. There is a wide variety of accommodation that will suit most budgets. 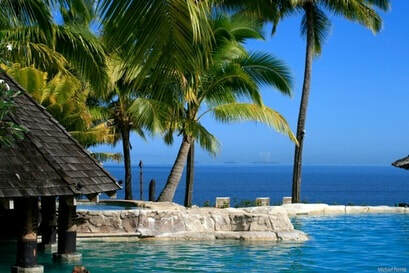 Fiji offers some perfect honeymoon destinations both on the mainland and surrounding islands. Treasure Island accommodates honeymooners very well and can even organise your wedding either on the white sandy beach or in the little chapel in true Fijian style. The mainland and other surrounding islands are very close and give you a wide choice of things to do, including snorkelling which is very popular here. ​There are thousands or gorgeous beaches in Australia, depending on where you would like to go. 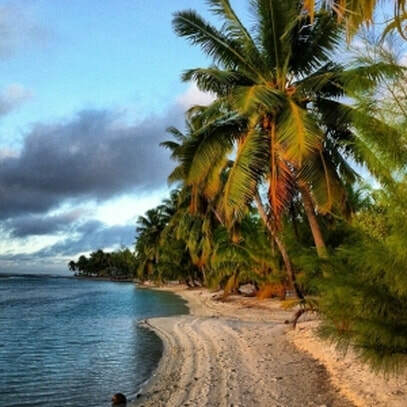 You will discover idyllic, untouched beauty in the Cook Islands. Aitutaki Beach is one of the best lagoons in the world - perfect setting with over-water bungalows as well as an abundance of fish species to see - it is a diver's delight. It is also the perfect romantic holiday where there is time to be totally in tune with each other....and nature at it's best. This is the perfect honeymoon destination if you want a secluded, quiet honeymoon because there isn't much to do other than the romancing on the beach or snorkelling and swimming. As well as Fiji there are so many South Pacific Islands for your honeymoon. Unforgettable destinations include Samoa, Vanuatu, New Caledonia, Tonga, Mystery Island, and lots more tiny islands that are truly beautiful. One of the best ways to experience the islands of the South Pacific is by taking a Cruise - there are many to choose from. Hawaii is a major international honeymoon destination. ​The friendly Hawaiian people, the perfect weather and the natural beauty of the island are just a few things that will draw you to Hawaii. You can explore the main islands cheaply, as fares between the islands are very low. Each island has something different to offer and seeing the volcanoes is a life changing experience if you can get up close to one. Koh Samui Thailand is a great destination to experience the Thai culture, food, friendliness and beauty while staying in luxurious resorts. A Thai holiday has everything and Koh Samui is the perfect spot, away from the hustle and bustle of Bangkok. If you are looking for a quiet, luxurious getaway then Nikki Beach Resort is perfect for honeymooners. The Samui Resotel Resort is a little further south of the noise and party goers - enjoy a beach massage EVERY DAY it is so affordable....Thailand will offer you great value for money. Bali, Indonesia is a VERY popular honeymoon destination. The scenery is breathtaking and there are lots of activities if you want to get involved. White water rafting is lots of fun and the trip to the volcano is awesome. If you don't want to party 24/7 make sure you are not in the heart of Kuta. There are also a lot of hawkers in some areas; shopping is very cheap; and you will find lots to do and well as countless romantic hideaways. In Sabah Malaysia you can combine the relaxation and pampering at the Nexus Resort with the excitement and adrenalin of the orangutans in the wild. Its as wonderful destination, amazingly peaceful beaches, lost of relaxing activities and you could even stop off for some shopping at Kuala Lumpur on your way home. 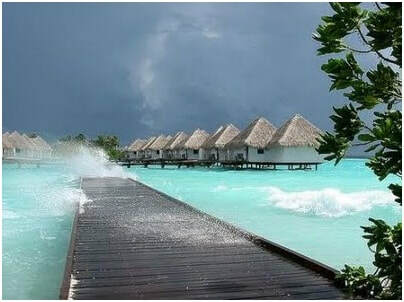 The islands of Tahiti are a leading honeymoon destination that saw the birth of the romantic over-water bungalows over 50 years ago. The volcanic islands seem to have been perfectly placed in these warm, rich blue and turquoise waters, lapping onto isolated white sandy beaches that stretch into the lush green mountainsides rising hundreds of metres into the sky. Despite being more than 9,000km from any other major land mass, it has all the facilities and services you could desire, from the freshest seafoods and finest international cuisines to the latest luxury resorts, great fun activities and plenty of quiet, romantic places to ensure your honeymoon is memorable. Enclosed by mountains and jungles to the west and the ocean and massive Belize Barrier Reef in the east, this Central American nation hosts hundreds of cayes (low islands) that are teeming with marine life. Dating back some 5,000 years, Belize was home of the Maya civilisation for some 2,500 years, with hundreds of ruins and relics to explore. With magnificent diving, hundreds of sandy beaches, and countless luxury resorts it is definitely a honeymoon destination to consider. A private Caribbean Island of just 120-hectares (300 acres) off the coast of Antigua in the West Indies, Jumby Bay Island is a land of beautiful white sand, lush landscapes, swaying palms and an exclusive, romantic hideaway for you to explore after the months of pressures leading up to your big day. Whether you prefer a resort room, a suite or a private villa, Jumby Bay will help your honeymoon to be a memorable trip of your lifetime. Everything you could dream for - and more. An archipelago of 115 islands in the Indian Ocean, the Seychelles is an amazing collection of coral reefs, natural and amazing beaches, mountain rain forests, nature reserves and sometimes astonishing marine life, including the very rare giant Aldabra tortoise. Whether you want to explore temples; browse through a local market; scuba dive or cruise to the reefs and marine park; see a rare giant turtle up close; simply lay on the beach; or spend your days around the resort, the choice is yours. 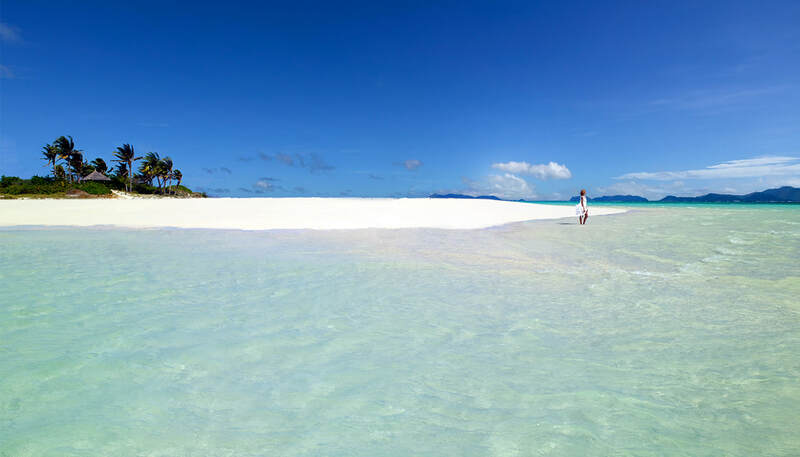 Another exclusive island, Amanpulo is only accessible by a one-hour private flight from Manila. Totally surrounded by pure white sands and turquoise waters, the island's villas and cabins - or casitas in Spanish - are hidden among the rich forests; along almost seven kilometres of beach; or towering over amazing views from the hills. A diver's paradise it is also the long-awaited destinations of newly-weds from around the world. Don't worry obout the dining - five international cuisines are on offer. You also have your own private buggy to explore the 85-hectare island - take a picnic and find a secluded gem. Find out where the most romantic places to watch the sunset are? Why not combine lots of different destinations and book a CRUISE?